The world's most expensive phono stage? | What Hi-Fi? The world's most expensive phono stage? Some days we're inundated with stories about iPod docks, others it may be a rush of new Blu-ray players. Today it seems phono stages are all the rage. Swiftly following on from news of a pair of phono preamps from Audio Research comes a release about the Aesthetix lo Eclipse making its UK debut. Now if you thought the Audio Research pairing were expensive, at £3368 and £6298 respectively, hold on to your hats. The Aesthetix lo Eclipse starts at £14,000, rising to an eye-watering £21,200 for the top model. Yikes. 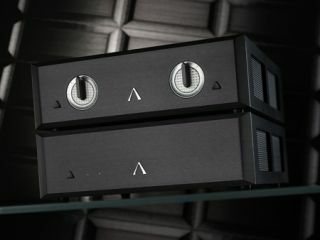 "The Aesthetix lo is an all-valve phono stage suitable for the most demanding cartridges, including low-output moving coils," the company claims. The casework is machined from aluminium billet and sits on four Harmonic Resolutions Systems' Nimbus Couplers (feet to you and me) specially made for Aesthetix. You also get all-valve amplification (16 valves), a separate valve regulated power supply (8 valves), two sets of XLR and two sets of RCA outputs per channel, plus either RCA or XLR inputs. A second power supply is optional. It even uses Stealth Technology. A new StealthCap by Peter Moncrief "dramatically reduces corrupting signal reflections in the capacitor plate, just as stealth technology in aircraft reduces radar signal reflections". Aesthetix goes on to claim that the lo Eclipse "is designed and engineered to deliver the highest attainable sound from a turntable". Sounds like a candidate for our Temptation section, or maybe a head-to-head with the Audio Research PH8. The standard Aesthetix lo Eclipse with a single power supply costs £14,000. Add a second power supply and you'll shell out £18,500. That still not enough? Then you can have the lo Eclipse with volume control and one power supply for £16,700, or with volume control and two power supplies for a range-topping £21,200.